What is Faith's Cleanse & Detox? Originally Faith's Cleanse & Detox was a locally known herbal food dietary supplement that has been working wonders for almost 15 years, and now under license has been renamed to Faith's Cleanse & Detox, as a tribute to the newest addition to our family Faith the Boxer. Faith’s Cleanse & Detox was developed and thoroughly tested using quantum physics principles over a period of three years. Our formula is backed by 30 years of experience with the use of herbs. 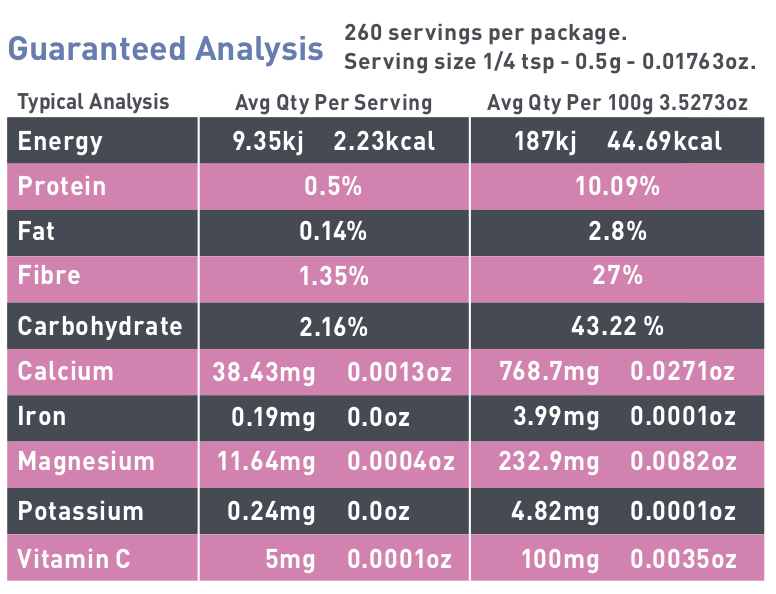 Each ingredient was selected for its documented medicinal and nutritional values, and has its own unique frequency that has been tested to ensure it resonates with similar frequencies in the body. This allows us to use fewer herbs with better results. There are many natural products on the market that may be effective in the things that Faith has a role in helping with. However, the Faith's Cleanse & Detox formula goes much deeper than selecting a variety of herbs that are known to have certain benefits. Each herb has been tested and selected for its own specific frequency that resonates with similar frequencies related to areas of the body. This allows the use of fewer herbs with better results. Faith's Cleanse & Detox is packed under license from Coburg Health by Augustine Approved and distributed worldwide by Augustine Approved. Faith's Cleanse & Detox is the result of over 30 years' experience by a dedicated group of animal lovers (including a bioengineer and naturopath/herbalist) who wanted the best for animals. Whose diet can Faith's Cleanse & Detox be added to? 4 piece measuring spoon set included. How does Faith's Cleanse & Detox compare to other products in its field? Faith's Cleanse & Detox does not contain pesticides or harmful chemicals. Synthetic copies of what is found in nature make poor substitutes and are often toxic. The formulators of Faith's Cleanse & Detox share my view that you cannot outsmart nature without consequence so we strive to strengthen the immune system rather than attempt to alter it. Combining Faith's Cleanse & Detox with a healthy diet and regular exercise is key to supreme health. Is this product suitable for my dog or cat? In a word - yes, however it is very important to be up front and explain that Faith is not for everyone. The first six months entails a Kick Start Cleanse which requires daily supplementation. If you consider it a hassle to add one more thing into your dog or cat’s diet then you may prefer to use a different product. Some of you may also find that your dog or cat will not be interested in the taste of Faith's Cleanse & Detox to start with. Whilst many devour it even straight in its powder form, the fussy eaters may take time to develop a taste for it. Augustine, Faith and my ultra-fussy little Mishka now eat it mixed in their food but it did take some time for them to adjust. Augustine will now even chew on it in capsule form as if it's a delicacy. In 30 years there has not been a single reported case of toxicity in any animal (including pregnant animals) using formulas from Coburg Health & Nutrition. Candida and yeast... will this help to restore healthy gut balance? From my experiences Faith's Cleanse & Detox has been very successful in promoting a healthy gut balance, and in turn bringing candida and yeast into normal and healthy balance. I've reviewed many before and after analysis reports from our customers that show clear evidence of Candida being brought back to safe levels. We also have dozens of before and after photos in our files including those on this page and on the Healthy Skin Bundles page. Please note that it is important to provide a diet that does not support candida overgrowth - a diet of processed foods high in sugars and simple carbohydrates encourages Candida overgrowth as yeasts thrive on processed sugars. Can I eat this stuff too? YES! The human label of Faith's Cleanse & Detox has been approved by the TGA for human consumption in capsule form. The human label is coming very soon and there is absolutely nothing wrong with consuming the canine & feline label of Faith's Cleanse & Detox. You can mix the recommended amounts below in half a glass of water and follow the same Healthy Life Progam shown above. Many people do not like the taste (including myself), hence why the human version will come in capsule form. OK I love what I've read but I think I'd rather Faith's Cleanse & Detox in capsule form for my cat, dog or myself. What can I do in the meantime until you bring out the capsule versions? You can do what I did for a long time and purchase capsules and a filling machine. It's cheap and easy! Capsule filling machine (when you get the hang of it you can make 100 capsules approx. every 5-7 minutes). Faith's Cleanse & Detox contains ingredients that have a role in assissting the body to flush out harmful toxins usually through the urine. Those with a genetic pre-disposition or a weakened immune system (compromised liver and kidneys), may suffer discomfort because the toxins begin to instead come out through the skin (the weakest part of the body), and not the bladder. If you or an animal in your care shows signs of detoxifying through the skin please contact us for further advice or consult a holistically trained or holistically aware health professional. There are two main schools of thought on how to tackle this problem. One way is to mask the symptoms of the problem by suppressing toxins that are trying to come out. If a person uses drugs to suppress the symptoms they are doing just that - suppressing rather than addressing and once the drugs wear off the subject is back to square one (most times worse than how bad they were when they initially started because now they have more toxins in their system from the drugs). The other is to help the body flush out all the toxins (and heavy metals) with the implementation of a healthy diet and the use of Faith. Eating clean may cause discomfort during the detoxification process. I’ve personally witness many dogs get rid of major skin problems (and at the least make them manageable) using Augustine’s SuperBoost and Faith, whilst simultaneously using coconut oil and Augustine’s SuperBath to sooth the skin during the detoxification process. Little Mishka the Maltese licked and chewed at her paws for over 12 years. 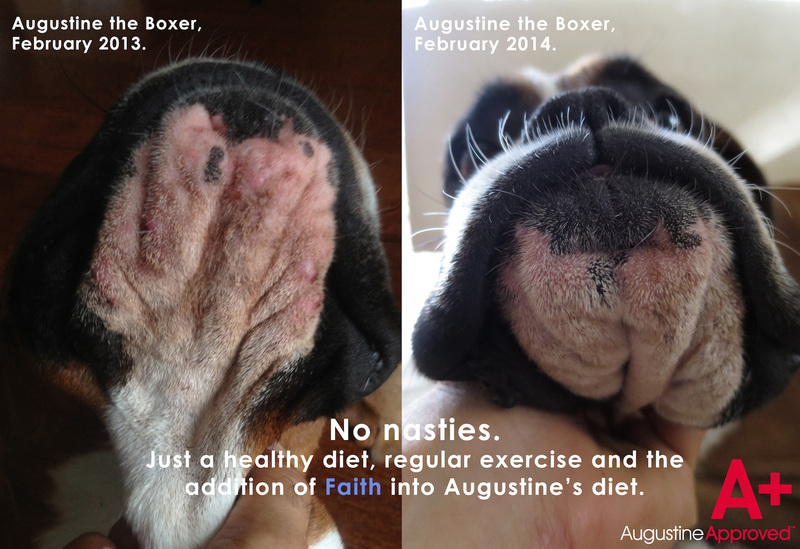 Five months into using faith along with the Augustine’s SuperFood diet the madness ceased. If you or an animal in your care suffers from what appears to be allergies please contact us so we can further assist you. Why isn't Faith's Cleanse & Detox certified organic? Faith's Cleanse & Detox contains herbs that are wild harvested and these fall outside organic certification guidelines. We have source certified organic ingredients and are now in the process of certifying Faith's Cleanse & Detox as organic. What are the best ways to incorporate Faith's Cleanse & Detox into my dog or cat's diet? Mix into any food with or without virgin cold-pressed coconut oil, olive oil or molasses. Serve as a standalone treat - mix in a bowl with a small amount of virgin cold-pressed coconut oil, olive oil or molasses. Visit our website for tips and tricks and to find out how to easily fill capsules. How long will a 260g jar of Faith's Cleanse & Detox last? Faith's Cleanse & Detox works differently to other products in its field and as you've already read, it may assist with a lot more than just parasites. After the initial six month Kick Start Cleanse, Faith's Cleanse & Detox becomes even more cost effective because the feeding amount is permanently reduced. 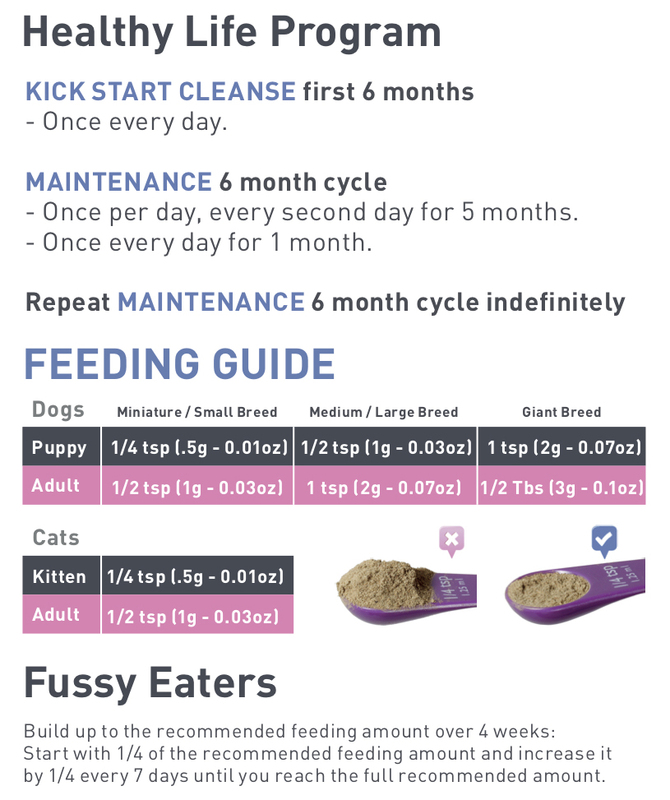 The chart below illustrates how many grams of Faith's Cleanse & Detox your dog or cat will require during the first year and subsequent years. *It costs less to feed puppies and kittens because in most instances the daily feeding amount is reduced to half. 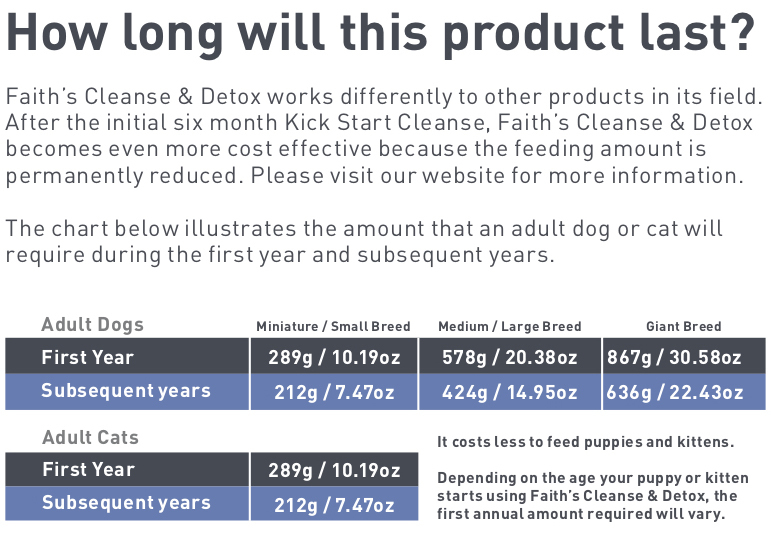 Depending on the age your puppy or kitten starts using Faith's Cleanse & Detox, the first annual amount required will vary. Do not take remedially. This product is not intended to diagnose, treat, cure, or prevent any disease. Additives, chemicals, colourings, dairy, fillers, flavourings, grains, gluten, irradiation, meat or meat by-products, MSG, palm oil, preservatives, salts, sweeteners, synthetics, and GMOs. Well crafted and well designed supplement. It is too early to tell how our dog is responding, but it appears to be very promising. Of course, we are doing everything to support his health, but I think the Faith is an essential component for his recovery. This is a beautifully packaged and prepared herbal product that reflects the care of the creator. Never will be without Faith again EVER !!! My 9yr old Chihuahua Bella was suffering with a yeast problem for months. No matter what I tried nothing was helping her. 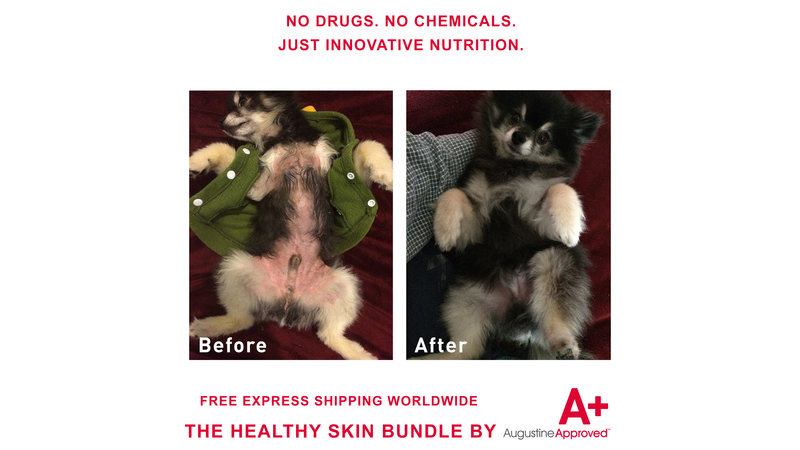 I purchased the Healthy Skin Bundle from Augustine Approved and with in two weeks Bella had stopped scratching and the horrid smell she had was gone. Then I ran out of Faith mid November and didn't reorder it... Now it's mid January and her yeast problem is back. I cannot beleive how quick it came back. I just put in an order for Faith, Augustine's SuperBoost and Dynacol Zeolite yesterday and it can't arive to me in the US ( New York ) fast enough. I will NEVER EVER be with out Faith again. Our 17-month old dog is very happy with Faith. He loves it in his raw vegetable and puree and human grade mince or as a treat with raw coconut oil. It's almost been 3 months since he started having this product daily. Prior to that when using a chemical product he was very upset and angry afterwards and would often drag his bum and rub it on the floor. One day our dog looked at us and with his poignant eyes told us to stop using toxic products. We didn't know any better, but now we do. We are at ease knowing that he is happy and healthy. - My dogs coats are now very shiny. - It has helped with Phoebes bad gas as her farts are nowhere near as smelly. With continued use I hope it will help reduce Pog's skin irritations. All my dogs are rescues who are now doing well. Prior to them coming to me they were malnutritioned. After using Faith for some days they all started to clean out. One of my dogs had very old gunk coming out if his ear that was never visible before. I also have a foster dog at the moment and his coat has started to be amazing within a week of getting Faith and Augustine's SuperBoost in his food. My dogs all have shiny coats and I am now able to put weight on the little one - something that I have not been successful in doing prior for a whole year. This product lives up to its name! I've tried all sorts of supplements but Faith is the very first supplement my dogs take willingly! FAITHfully, they will ask for it every morning! I have 3 dogs (all rescued) and I'm so thankful to have found Faith. My youngest is a local breed with persistent tummy issues. Whilst it's not totally resolved, there are great improvements and I have Faith that this product will help him sort his tummy real soon! Thank you Faith for being a life-saver and inspiration! I'm about to place another order! My pup had an intermittent rash on her belly for months (nothing too serious but it was irritating for her). After speaking with Phivo I decided to give Faith a try. In no time at all the rash had completely disappeared and the hair on her belly began to grow back. I take comfort in knowing that Faith is a truly natural product that helps to promote correct gut-balance which in turn improves the skin and coat, rather than just masking the symptoms like some other products. I have two dogs - Ben a Maltese X who had digestive issues to the point of losing hair and suffering from runny stools, and my other dog, Paris a Lhasa Apso who had a skin infection and a systemic staph infection. I came across Augustine's SuperBoost and Faith about a year ago and I began adding it to both their food. I had remarkable results for both! Firstly Paris' skin began to clear up and settle down to normal in about two months. She was particularly bad so it took a little time. Ben responded really well and soon he began to grow his hair back and became more lively. Ben also had some chiropractic work done as he had an injury to his neck which is why he had a lot of pain. So one year later Ben is off his meds, his hair is thick and fluffy, his eyes are bright and he is like a puppy again. Paris is skin infection free with only the occasional ear flare up. Overall she is happy and bubbly. Ben is 14 years old and most people think he is 10. Paris is 11 and looking younger as well. I can't say enough about Augustine's SuperBoost and Faith - they are brilliant and I feel good that they are getting quality nutrition. I'm now a firm believer in the Augustine Approved approach. It's been a bit over two weeks now and I have started to notice less excessive grooming in my cat who has had issues with her skin since she was 12 months old. She has licked off all the hair on half her belly and earlier this year started chewing her front paws and now licked off the hair on half her tail. I know it's a slow journey but I am hopeful that Faith will deliver. Thanks Phivo for your support. 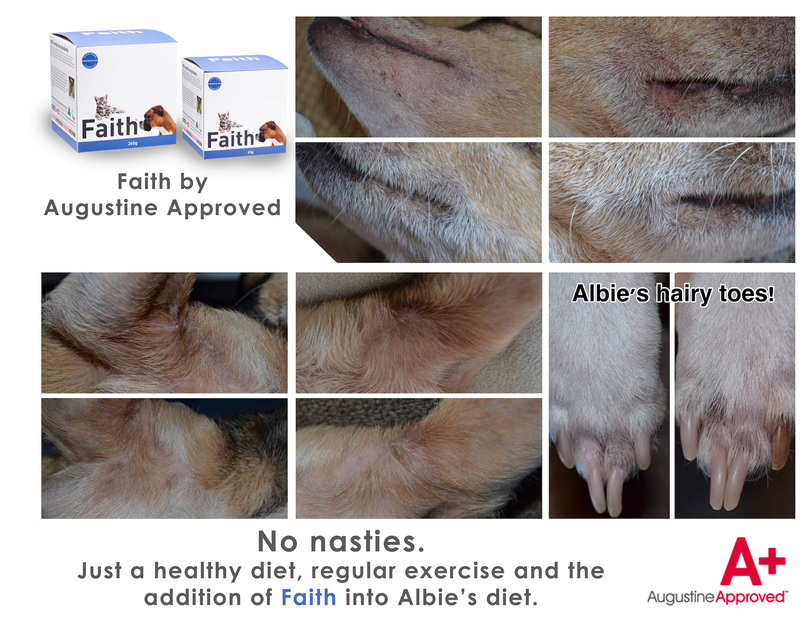 Our dogs love the Faith product and its worked so well keeping them naturally healthy and free of nasties! I also love the packaging and spoon set.